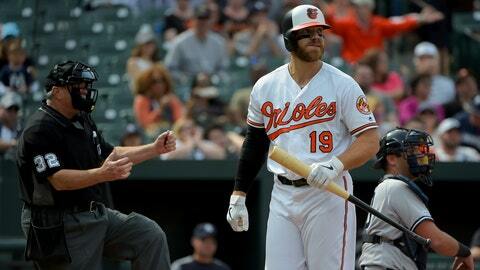 Davis was 0 for 4 with two strikeouts in Sunday’s 15-3 loss to the New York Yankees. He is 0 for 23 with 13 strikeouts this season and is hitless in 44 at-bats since a second-inning double off James Shields of the Chicago White Sox last Sept. 14. Davis two shy of the record for consecutive hitless at-bats by a position player, according to the Elias Sports Bureau. Los Angeles Dodgers infielder Eugenio Velez went hitless in his final 46 at-bats of the 2011 season, one more than the previous mark shared by Pittsburgh’s Bill Bergen (1909), Dave Campbell of San Diego and St. Louis (1973) and Milwaukee’s Craig Counsell (earlier in 2011).